Olivier salad (Russian: салат Оливье, salat Olivye)[Note 1] is a traditional salad dish in Russian cuisine, which is also popular in other post-Soviet countries, many European countries, Iran, Israel, Mongolia and also throughout Latin America. 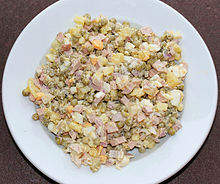 In different modern recipes, it is usually made with diced boiled potatoes, carrots, brined dill pickles, green peas, eggs, celeriac, onions, diced boiled chicken (or sometimes ham or bologna sausage), and tart apples, with salt, pepper, and mustard added to enhance flavor, dressed with mayonnaise. In many countries, the dish is commonly referred to as Russian salad. A variation called Stolichny salad (Russian: салат столичный, "capital city salad") exists, and is also popular in the Russian cuisine. In Russia and other post-Soviet states, as well as in Russophone communities world-wide, the salad has become one of the main dishes on zakuski tables served during New Year's Eve ("Novy God") celebrations. Hermitage restaurant in the 20th century. The original version of the salad was invented in the 1860s by a cook of Belgian origin, Lucien Olivier, the chef of the Hermitage, one of Moscow's most celebrated restaurants. Olivier's salad quickly became immensely popular with Hermitage regulars, and became the restaurant's signature dish. The exact recipe — particularly that of the dressing — was a zealously guarded secret, but it is known that the salad contained grouse, veal tongue, caviar, lettuce, crayfish tails, capers, and smoked duck, although it is possible that the recipe was varied seasonally. The original Olivier dressing was a type of mayonnaise, made with French wine vinegar, mustard, and Provençal olive oil; its exact recipe, however, remains unknown. At the turn of the 20th century, one of Olivier's sous-chefs, Ivan Ivanov, attempted to steal the recipe. While preparing the dressing one evening in solitude, as was his custom, Olivier was suddenly called away on some emergency. Taking advantage of the opportunity, Ivanov sneaked into Olivier's private kitchen and observed his mise en place, which allowed him to make reasonable assumptions about the recipe of Olivier's famed dressing. Ivanov then left Olivier's employ and went to work as a chef for Moskva, a somewhat inferior restaurant, where he began to serve a suspiciously similar salad under the name "capital salad" (Russian: столичный, tr. stolichny). It was reported by the gourmands of the time, however, that the dressing on the stolichny salad was of a lower quality than Olivier's, meaning that it was "missing something." Later, Ivanov sold the recipe for the salad to various publishing houses, which further contributed to its popularization. Due to the closure of the Hermitage restaurant in 1905, and the Olivier family's subsequent departure from Russia, the salad could now be referred to as "Olivier." One of the first printed recipes for Olivier salad, by Aleksandrova, appearing in 1894, called for half a hazel grouse, two potatoes, one small cucumber (or a large cornichon), 3-4 lettuce leaves, 3 large crayfish tails, 1/4 cup cubed aspic, 1 teaspoon of capers, 3–5 olives, and 1​1⁄2 tablespoon Provençal dressing (mayonnaise). The earliest published recipe known to date appeared in the Russian magazine Наша пища (Our Cuisine) № 6 (31 March 1894). This magazine published from 1891 to 1896, editor M. Ignatiev, stated that the original recipe contained "mogul sauce" a.k.a. "kabul sauce" (along the lines of Worcestershire sauce), manufactured by John Burgess & Son[Note 2] (the brand he reputedly used) and Crosse & Blackwell. Some later recipes substituted soy sauce for the mogul sauce. The book Руководство к изучению основ кулинарного искусства (Guide to the Fundamentals of Culinary Arts) (1897) by P. Aleksandrova gave a recipe containing grouse, crayfish, potatoes, cucumber, lettuce, aspic, capers, olives and mayonnaise. The author wrote that veal, partridge or chicken could be substituted but that the authentic recipe contained grouse. In post-revolutionary Russia, cheaper ingredients were substituted for the originals: grouse was replaced by chicken or sausage, crayfish by hard-boiled egg, cucumbers, olives and capers by pickled cucumbers and green peas. Earlier, it always included cold meat such as ham or veal tongue, or fish. The mid-20th century restaurant version involved not just vegetables, but also pickled tongue, sausage, lobster meat, truffles, etc. garnished with capers, anchovy fillets, etc. Some versions mold it in aspic. In modern usage, it is usually boiled diced vegetables bound in mayonnaise, with Doktorskaya-type sausage (a genericized Soviet bologna brand). 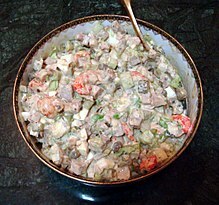 The most common alternative version, where it is replaced with boiled or smoked chicken, is called Stolichny salad, after Ivanov's version. A multitude of other versions, named, unnamed, and even trademarked exist, but only Olivier and Stolichny salad have entered the common vernacular of post-Soviet states. Today's popular version of Olivier salad — containing boiled potatoes, dill pickles, peas, eggs, carrots, and boiled beef/chicken or bologna, dressed with mayonnaise — is a version of Ivanov's Stolichny salad, and only faintly resembles Olivier's original creation. This version was a staple of any Soviet holiday dinner, especially of a Novy God (New Year's Eve) dinner (to the extent that its presence was considered on a par with Soviet Champagne or mandarin oranges), due to availability of components in winter. Even though more exotic foods are widely available in Russia now, its popularity has hardly diminished: this salad was and maybe still is the most traditional dish for the home New Year celebration for Russian people. Festive Russian and post-Soviet states' homemade versions are traditionally up to the cook's whim. While some of the ingredients are considered to be basic and essential, others are either favoured or angrily dismissed as a threat to the supposed authenticity. The biggest Olivier salad, weighing 1841 kg, was prepared in December 2012 in Orenburg. The salad is widely popular in the Balkans. It is known as руска салата (ruska salata) in Bulgaria, Serbia, Macedonia, and sallatë ruse in Albania, both literally meaning "Russian salad." 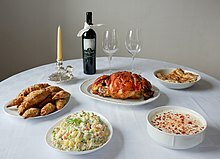 It is similarly called ρώσικη σαλάτα (rossiki salata) in Greece and can be found on almost any restaurant's menu. The Bulgarian version of the salad usually consists of potatoes, carrots, peas, pickles and some sort of salami or ham. The Greek version usually contains no meat. In Croatia and Slovenia it is typically prepared without meat, and is usually called francuska salata in Croatian and francoska solata in Slovene, both meaning French salad. In Bosnia and Herzegovina both the ruska salata and francuska salata (which is essentially Russian salad prepared without meat) are very popular, especially during holidays. The Romanian variant, called salată de boeuf ("beef salad"), is considered a traditional dish. It is a combination of finely chopped beef (or chicken) and root vegetables, folded in mayonnaise and finished with murături, traditional Romanian mixed pickles. It can be made vegetarian, too. In Czech it is called simply bramborový salát (potato salad). It consists of boiled and cubed vegetables (potatoes, carrots, parsley and celery root), finely chopped onions and pickles in mayo dressing, often with diced hard-boiled eggs, some kind of soft salami or canned green peas. It is the side-dish of choice to go with schnitzel or breaded carp, staple Christmas meals in the Czech Republic. Polish sałatka jarzynowa or sałatka warzywna ("vegetable salad", often simply called salatka) is always vegetarian, consisting of peas, hard boiled eggs, and the mirepoix, always cut into small cubes, seasoned with mayonnaise, salt, pepper. Recipes usually vary by region (tart apples or pickles can be added) and even by household, but never to the point of meat being added. A notable exclusion is szałot (Polish pronunciation: [ˈʂawɔt]), a Silesian variety which may include not only boiled potatoes, carrots, peas and boiled eggs, but also bacon, sausages or pickled herring. Such salads are often served on family celebrations, in particular on Christmas Eve (Christmas Eve dishes are very different from the food that is served on Christmas Day). Ensaladilla rusa ("Little Russian salad") is widely consumed in Spain where it is served as a tapa in many bars. It typically consists of minced boiled potato, minced boiled carrots, canned tuna, minced boiled eggs, peas, and mayonnaise. This bears some similarity to versions of macédoine de légumes froid. In Italy, Insalata russa has same ingredients. A similar version is also popular in Portugal, where it is called salada russa. It is usually served either as a standalone dish or as garnish to fish dishes, particularly fish fillets. In both Iceland and Denmark it is called Italian salad and contains carrots and green peas in mayo dressing. Often and most popular is to pair the salad with smoked meat on bread. European cafes and delis often provide an entire range of Olivier-style salads, ranging from passable to gourmet. Additionally, cafeterias, convenience stores, and truck stops sell a number of sub-par factory packaged or locally made versions, mostly extremely simple, using basic ingredients flooded with an abundance of cheap mayonnaise-like dressing. In Turkey it is known as Rus salatası. The Turkish version consists of boiled and sliced carrots and potatoes, sliced cucumber pickles, boiled peas and mayonnaise and is sometimes decorated with boiled and sliced eggs, black olives and beet root pickles. It is served as meze and is used as a filling for some sandwiches and kumpir (jacket potato). Another Turkish name for Olivier salad is Amerikan salatası ("American salad"), a euphemistic misnomer originating from the Cold War period. Olivier salad (Persian: الويه‎) is popular in Iran, where it is usually made with potatoes, eggs, Persian pickled cucumbers, carrots, chicken, peas and mayonnaise, and is frequently had as a sandwich filler. It is a popular salad in Pakistan and India as well, where it is usually made with potatoes, peas, apples (and/or pineapples) and mayonnaise and is frequently used as a side dish in cafes. Another version of Russian salad is also very popular in Pakistan which bears no resemblance to Olivier salad and instead is a cabbage and apple slaw. 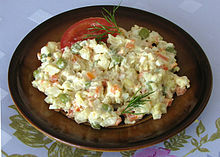 Olivier salad is believed to be introduced as a "Capital salad" or "Niislel salad" in Mongolia during the Soviet period. It usually consists of minced ham and carrots, minced boiled eggs, minced boiled carrots and potatoes dressed with mayonnaise. It is widely popular amongst Mongolians, especially during the festive seasons. Because of immigration of Italians, Spaniards, and Eastern Europeans, the dish is also very popular in Mexico, Ecuador, Peru, Argentina, Paraguay, Uruguay, Brazil, Venezuela and the Dominican Republic where it is called ensalada rusa and has been reduced to its minimum: minced boiled potatoes and carrots, green beans and abundant mayonnaise-based dressing. In Argentina it is usually served on its own as a first course, or with a very thinly sliced beef wrapping called matambre, in a dish called matambre con rusa. Argentinians of Eastern European Jewish origin may make the salad with tuna. In Venezuela it is a traditional Christmas sidedish. ^ It is called "Olivier salad" in Belarus, Russia, Ukraine, as well as in Iran and the United States. ^ "Самый большой салат "Оливье" [The largest Olivier salad]" (in Russian). The book of records of Russia. 2012-12-16. ^ "Мировой рекорд по приготовлению салата "Оливье" установлен в Оренбурге" (in Russian). RIA Novosti. 2012-12-16. Archived from the original on 2012-12-19. Alan Davidson, The Oxford Companion to Food, Oxford, 1999. ISBN 0-19-211579-0. This page was last edited on 20 April 2019, at 11:21 (UTC).